Images and/or video sequences are analyzed, their content is codified in terms of symbolic descriptors stored in a database system. 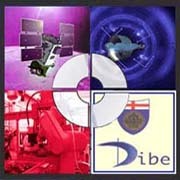 The research activities of the SIGNAL PROCESSING and TELECOMUNICATION GROUP at DIBE are summarized in the following sections.The research of the Numip area is focused on image processing and analysis techniques at a numerical level, rather than at a symbolic level. At present, two approaches are under study. One uses fuzzy techniques and is centred around a fuzzy intensity connectedness measure, that can be applied, for instance, to image filtering and segmentation. The other approach is probabilistic and is implemented in a Markovian framework for image segmentation and classification. The group is actively involved in the design of image processing techniques with the purpose of improving the current medical practice. They range from segmentation to registration, from interpretation to machine learning, generally independent from the particular modality of acquisition (MR, CT, PET, conventional and acoustic microscopy). A number of national and international contracts (currently on or just completed) provide a suitable framework to co-operate with some of the major industries, involved in the production of medical apparatus, and with famous hospitals all over Europe. The group is now involved in tele-medicine and remote consultation and processing of medical images. In the recent past, the area has been involved more and more in the remote-sensing domain. The enormous amount of RS data calls for automated and robust image analysis techniques. In 1996, the area started a project for the Analysis and segmentation of remote-sensing images for land-cover mapping. 2D and 3D image processing and segmentation techniques are under development at the Telemedicine labs for the enhancement of structures of interest from tomographic data. The SAR polarimetric and interferometric acquisitions results are respectively semi-automatic extraction of the shoreline, and noise-free determination of a digital ground elevation model (DEM).